Mathews sends thanks for the calendar and an early Easter check. 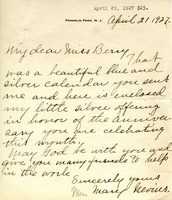 Hannah S. Mead thanks Martha Berry for the calendar she received. She also congratulates Martha Berry on the 25th anniversary of the school. 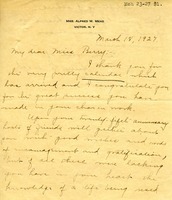 In this document, Hattie A Mead thanks Miss Berry for the calendar she sent and wishes her congratulations for her good work. Mrs. McKowen thanks Martha Berry for the anniversary calendar she received and sends a $25 check for the Silver Anniversary of the school. Mrs. McLain thanks Martha Berry for the calendar and Southern Highlander she received. 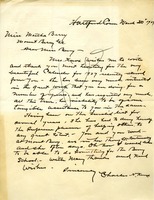 She also sends a $100 donation to the Berry Schools and gives her sympathy to Martha Berry over the loss of her mother. 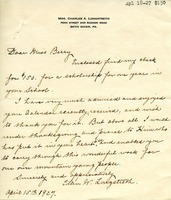 Mrs. Safford sends a check for $10 on behalf of the Missionary Guild, M.E. Church. She also thanks Martha Berry for the calendar and school magazine. S.E. Lowrie thanks Martha Berry for the Silver Anniversary calendar she has sent and encloses $5 to be sent as many calendars as that will buy. Lowrie suggests that souvenir spoons with the picture of Roosevelt and other prominent visitors would be popular. Mrs. Longstreth sends a $150 check to be applied towards the tuition of a student at The Berry Schools. She also thanks Martha Berry for the calendar she received. 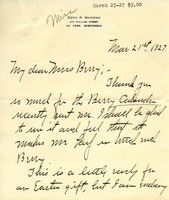 Lauder writes a personal note to Berry to thank her for the beautiful calendars. She writes that she is an invalid who doesn't venture far from home but that she nonetheless wishes she could see Berry "in the flesh." She has seen a photograph of Berry, she writes, at her Miss King's house, and casts her eyes on it every time she walks in and out. That she has lost many friends and relatives this year is to be expected, she shares, as she is nearing her 80th birthday. Mrs. Lawton thanks Martha Berry for the calendar that was sent to her and sends a $25.00 donation to the Berry Schools in return. 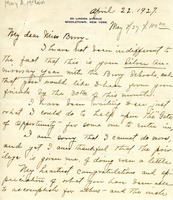 Letter from Rev. 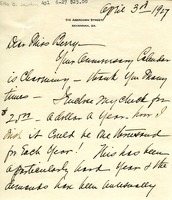 George William Kelly thanking Martha Berry for a gift (calendar), congratulating her on the 25th anniversary of the Berry School, and informing of an enclosed donation to the celebration cost. 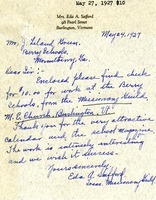 Mrs. Jaeger thanks Miss Berry for the Berry School calender and encloses a donation for the school's silver anniversary. She hope that the school will receive many donation for that anniversary. Emma Ireland sends a $25 donation to help celebrate Berry's 25th Anniversary.